Hall of the Mountain King: Review: Brainstorm, "Soul Temptation"
Where has this band been hiding from me? This album has that perfect blend of prog and old school power metal that usually makes me stand up and pay attention. From the lead song "Highs Without Lows," it drew me in. "Soul Temptation" mixes galloping riffs and powerful vocals, with just a taste of mystical moodiness. It's a potent combination. The songs on the album range from blazing speedsters to the dramatic "Fading." One of the most impressive turns on the album is the trilogy of songs "Trinity of Lust," which includes "Shiva's Tears," "Fornever" and the title track. The songs switch from exotic middle-eastern flavors to full-on metal grooves. The only weakness the album has is in the lyrics, which are often awkwardly constructed. To be fair, English isn't vocalist Andy Franck's first language, and these lyrics are much better than anything I could produce in German. So I guess I really can't complain. 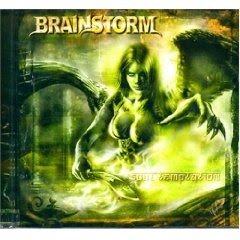 Brainstorm has two previous albums out on Metal Blade that I somehow managed to overlook. I don't intend to miss them again. Review: Nevermore, "Enemies of Reality"
Review: Circle II Circle, "Watching in Silence"